Posted on March 21, 2015 by J. So let’s take the idea that Sr. Aloysius is not an unredeemable person, but someone who sees her mission as protecting the young children in her care from all harm. 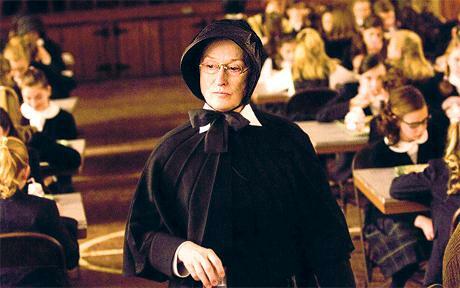 When we first meet her, in Scene 2, it is clear that she is a woman of strong and firm opinions on matters like teaching methods. You may not agree with those methods, but you need to give thought to why they matter to her. Why should a teacher showing enthusiasm for a subject be a bad thing for kids to experience? Why should knowledge be delivered as bitter medicine? What benefit is derived by this approach? Because in Sr. Aloysius’ eyes, there is a benefit. It’s not an arbitrary choice on her part, and it’s not because she’s generally mean. She sincerely thinks this is best for the kids. So for Sr. Aloysius, there is comfort and security in regulations. If she fears uncertainty – doubt – then her desperate clinging to her set of rules helps quell her fears. So we have a nun who means well and wants to do the best job she can as principal (which means protecting her charges to the utmost), but is scared to death of the grey area and enforces the “Rule of Law” at her school both to protect her charges and to protect herself from the terrifying unknown. Count both the adjectives and the verbs in that last paragraph. Notice how I haven’t mentioned words like severe, heartless, unfeeling, mean-spirited, vindictive, vengeful, harsh, etc.? Instead, I’ve given you motivations that you can use to drive what you do. The playwright has written lines that have all the severity and mean-spiritedness necessary. You don’t have to work to add any of that negative emotion to the performance. The words will take care of that. Your job, actually, is to do the opposite – to temper the strong language of the play with an emotional life that makes sense and creates a three-dimensional human being instead of a stereotype. But let’s go back to the script of Scene 2. Sr. Aloysius calls art class a waste of time. Play the emotion (“she’s disparaging the arts”) and you play into the stereotype. But if you stop and think about how someone could justifiably consider the arts a waste of time (what would you replace them with, and what benefit would the students derive from the replacement? ), you take just a little bit of negative energy out of that line. William London, the unruly child in Sr. James’ class, appears to be Sr. Aloysius’ favorite whipping boy, and she seems to be unreasonable, at least at first. But read page 15 again. What if Sr. Aloysius’ assessment of William’s life is absolutely spot on? Forget how she says it, just look at the facts. Does she become just a little bit more understandable? More next time . . . This entry was posted in Acting, Script Analysis and tagged Acting, acting technique, Actor, Community Theater, Script Analysis. Bookmark the permalink.